What’s in the Museo Geominero? Well, pretty much everything that’s ever been dug out of the ground in Spain. Minerals, fossils, dinosaur bones, human skulls and gems. There aren’t many artifacts, but a few arrow heads make the cut, probably because they are made of flint. 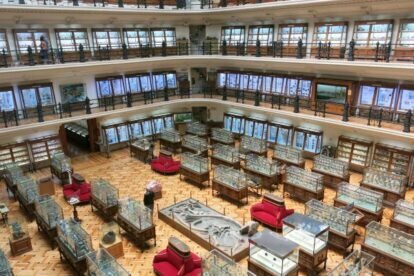 This delightful but little-known Madrid museum also boasts a stunning collection of precious stones from around the world. Now while I can happily look at fragments of glyptodon all day long, if that’s not your cup of tea, there are plenty other reasons to pay this place a visit. The building itself is amazing; the stained glass ceilings, and four floors of galleries which are flanked with beautiful display cabinets are a visual treat. You access the galleries by tiny corkscrew staircases; the kids will love it! Another plus is that it’s nearly always empty – few know about this place, and I have asked many people; blank faces every time. It’s usually an oasis of peace, and there are red velvet banquettes where you can sit and write your postcards or edit your Instagrams or whatever, if you are really not interested in minerals. Also, it’s right by Calle Ponzano of cool restaurant fame, so if you have half an hour to kill before Spanish lunchtime starts (14:00) step inside the Geominero Museum. Oh, and did I mention it was free? I know! Don’t forget I.D. though – they won’t let you inside without some.